Watch a CNN International 30-minute special at 1630 GMT June 30 putting the Gulf oil spill in a global context. Why the spill has repercussions beyond the Gulf and where to find the untapped or under-exploited oil reserves. 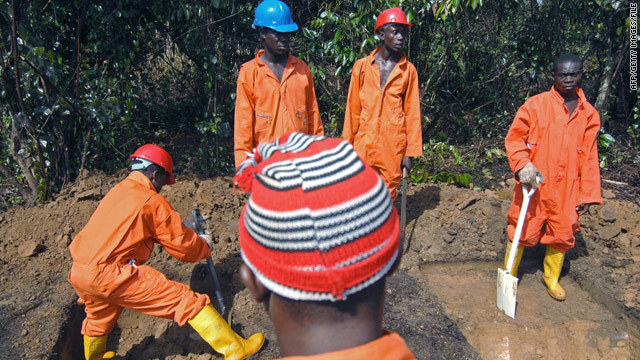 Niger Delta, Nigeria (CNN) -- Nigeria's Niger Delta is one of the most oil-polluted places on the planet with more than 6,800 recorded oil spills, accounting for anywhere from 9 million to 13 million barrels of oil spilled, according to activist groups. "The whole world is trembling and even the president of America had to do a personal visit to the site. The U.S. will have put serious measures in place to stop such situations happening in the future," said Ken Tebe -- a local environmental activist who is visibly shaken by what he regards as a double standard. "It's funny because we've been dealing with this problem for 50 years. I even heard BP will pay $20 billion in damages (for the U.S. spill). When will such hope come to the Niger Delta?" Tebe asked. The U.S. imports about eight percent of its oil from Nigeria. That is nearly half of Nigeria's daily oil production and makes Nigeria the fifth-largest exporter of oil to the United States. Tebe, like other activists, focuses his energy and anger against his own government and the oil companies he blames for neglecting the region -- but he feels the U.S., as the largest consumer of Nigerian oil, also must also play its part. "It's very, very bad because Nigeria is the fifth largest exporter of oil to the U.S., and the fact that Nigeria has been going through such issues for the past 50 years with little or no concern even from the U.S. government goes a long way to show you that they look at the Niger Delta as an oil field that people don't need to live in." Oil companies operating in the Niger Delta believe the figures are exaggerated. Mutiu Sunmonu, the managing director of Shell Nigeria, told CNN the industry is committed, after any spill, to "restore the environment to its previous status." Shell last year paid $15.5 million in an out-of-court settlement in a civil case brought by members of Saro-Wiwa's family and others. It was the only company operating in Ogoniland, and no oil has been pumped there since, yet the locals continue to complain of oil spilling from the maze of pipes criss-crossing their land. "There's no fish in the river anymore," he told us, his clothes sodden in the rain, "So there's no way I can feed my family apart from fetching firewood like this." The money he makes from selling the wood helps pay for food. The 700,000-square-kilometer Niger Delta is one of the most important wetlands in the world and home to 31 million people -- 60 percent of whom, according to the U.N. Development Program, depend on the natural environment for their livelihoods. Chevron, Agip, ExxonMobil are among the other companies operating in the Delta, but Shell is the only company in the region to release regular reports on its operations. Shell's Sunmonu said: "I am not naive to believe that Shell can fix the problem in the Delta. Ninety-five percent of our revenue -- after tax, after costs -- goes back to government." And so the oil companies' argument goes: They pay the Nigerian government and it is the government's responsibility to provide investment, security and pressure on private business. "Even if we pour all our earnings into the Delta - into development and infrastructure - it would still be a drop in the ocean," said Sunmonu. However, when pressed on the one issue for which the oil companies are legally responsible -- whatever the difficulties -- oil spill cleanup, Sunmonu insisted: "We will clean up and remediate the environment regardless the cost of the spill." Yet, as we leave Peter Bornu and his wife scavenging for firewood, it's clear many locals don't believe the oil companies. "Soil is turned upside down, money has been allocated and the cleanup is done," explained Ken Tebe. The oil companies regularly contract out the cleanup operations to local crews, he says, who carry out their operations on the cheap. "The truth is that the oil has not been mopped up from the soil. We have a series of spills in the Niger Delta for more than 30 years that have not been cleaned up," Tebe said. "There'll be new oil blocks so we can meet the quota we send to the U.S." said Tebe. "That'll mean there'll be an increase in oil spills, more gas flares, and resources conflict is going to be on the increase."